Poem of the Day, April 24: Freestanding, Carol Dine | Welcome to the new Journalverse! 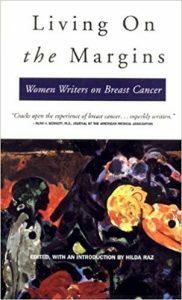 Living on the Margins: Women Writers on Breast Cancer is a literary anthology of breast cancer with a distinguished list of 18 contributors, all writers–poets, critics, academics, editors, essayists. Their writing, wide-ranging in genre, style, and tone, includes personal narratives, poetry, academic essays, and an interview. Contributors include Maxine Kumin, Safiya Henderson-Holmes, Eve Kosofsky Sedgwick, Lucille Clifton, Alicia Suskin Ostriker, and Marilyn Hacker. 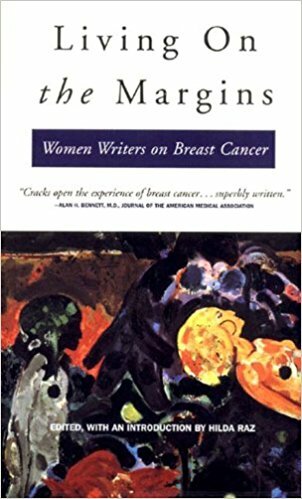 The editor, Hilda Raz, argues that because there hasn’t been much literature on breast cancer (there’s been a “margin of missing literature,” she claims) this collection was brought into being. Purchase it here. Carol Dine has published two books of poems, Trying to Understand the Lunar Eclipse and Naming the Sky. For “Treatments: A Journal” she received the Sword of Hope Award from the American Cancer Society. Her bilingual manuscript Light and Bone/Luz y hueso, based on photographs of the mummies of Guanajuato, Mexico, was presented in a multimedia performance piece by choreographer Paula Josa-Jones at the Boston Conservatory Theatre. Carol teaches at Suffolk University, Boston. from the skin of my back. it’s the one that’s faded. a dancer arch the highway of her back. beside it, a horizontal scar. Write a poem or prose or letter to someone you know who has (or survived, or didn’t survive) breast cancer. 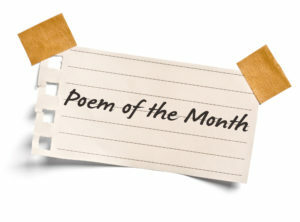 If you have had breast cancer yourself, write a poem to your body.